As if nothing had happened. The Chinese climber Wang Jing has received her Everest certificate from the hands of Nepalese government officials in Kathmandu. Thus it is certified that the 41-year-old has scaled the highest mountain in the world on 23 May – officially and above all with no ifs and buts. Strange. The Nepalese newspaper “The Himalayan Times” reports that Wang claimed in her application to the Tourism Ministry that she had been flown by helicopter to Camp 2 on 10 May but had descended to the Base Camp and again ascended after a two day rest. In other words: She would have climbed the whole route to the top. According to the newspaper an “Icefall Doctor” laughed about Wang’s claim and said that after the avalanche on 18 April, which had killed 16 Nepalese climbers, definitely no one had climbed through the Icefall. A member of Wang’s support team, who does not want to be named, also denied that the Chinese had descended to the Base Camp. 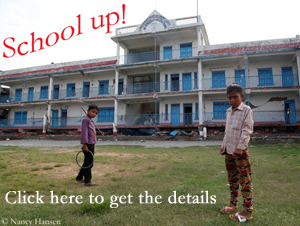 The government does not seem to worry about that. “It isn’t time to go by due procedures, as Wang’s summit was considered special in a time of crisis and uncertainty”, said Joint Secretary Madhu Sudan Burlakoti at the ceremony in Kathmandu. 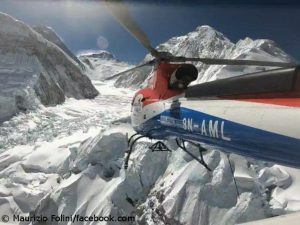 No word about the investigation report of the Civil Aviation Authority of Nepal (CAAN) about the use of helicopters on Everest. The commission recommends a strict rule to ban rampant use of helicopters above Base Camp, urging the authorities to permit such flights only for rescue missions – and not to transport material or even climbers to the high camps. A committee is to get to the bottom of it. Since Friday, new guidelines for helicopter rescue have been in force in Nepal, with which the government wants to prevent insurance fraud with “fake rescue flights” in the future. 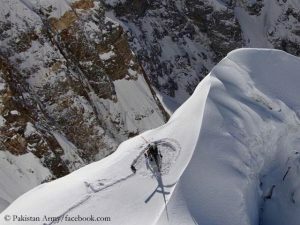 Good news from the Karakoram: Alexander Gukov is saved. 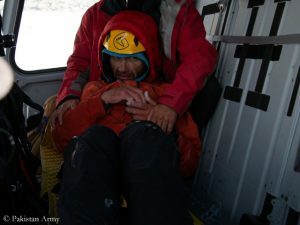 The 42-year-old Russian climber had been trapped for almost a week on the North Ridge of the seven-thousander Latok I at 6,200 meters, without food or equipment.